Home / Blog / “Than I” or “Than Me”? Nobody blogs better than me. Or should that be …better than I? Believe it or not, this question has been debated for centuries, and even though grammar experts seem to have arrived at a consensus, strangely enough, everyday speakers of English tend to violate the rule more than they obey it. What’s up with that? Ed likes bowling more than (me/I). Ed likes bowling more than I like bowling or more than I do. Ed likes bowling more than Ed likes me. But what about more typical uses of the comparative than — like the one I started with: Nobody blogs better than (me/I)? Sentences like this can only mean one thing. Which is correct? These days most usage guides and grammar books will tell you to use the nominative case pronoun after the comparative than: I, he, she, we, they. The reason is that this kind of sentence is assumed to contain an elliptical clause — a clause with words missing that the reader infers from context. When we read ...more than I, we assume it means …more than I do. Or, in this case, …more than I blog. In this way of looking at it, than serves as a conjunction linking the two clauses: Nobody blogs better and I (do). Since that makes the pronoun the subject of the verb, we need the nominative case. Simple. If we accept this explanation — and it’s the most common one around today — we should almost always use the nominative case pronoun after than. The only exception would be in rare sentences like the second bowling example above. Google’s N-gram viewer shows that than I appears far more frequently than than me in publications over the past 200 years. This seems to confirm that this is the right answer, right? Well, I suppose so, but how do you explain the fact that everyday speakers of English — at least in most parts of America — are far more likely to say than me in conversation? Why does than I sound a bit uncomfortable, a bit stilted? Don’t these sentences sound natural and common? She’s much better than me at math. He’s a faster runner than her. I’ve got a bigger appetite than him. Nobody throws better parties than us! Can we really say all these sentences are wrong? Many do, but they are probably unaware of the other way of looking at the word than. This way of looking at it means that than me works as a prepositional phrase modifying the adverb better. And, of course, if the pronoun here is the object of a preposition, then you need the objective case pronoun me. Both ways of looking at this sentence make perfect sense grammatically, and that’s why I don’t consider it wrong to use the objective case pronoun after the comparative than. Others will disagree, however, and many authorities will declare it wrong. You should know that before you use it in formal writing. You will probably be better off sticking with the currently popular way of looking at it than the analysis of Bishop Lowth. But at least you can take comfort in knowing that you probably know more about this subject than the ordinary grammar critic does. 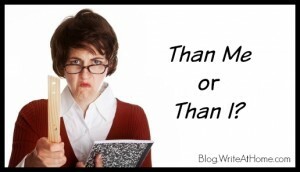 Well, I do believe that when it is in a written form, one must/should use “than I”; when spoken, one can use “than me”, though I prefer to use always the nominative case of the pronoun. Thanks for this. How about when to use “call in” and “call on” . This was interesting, thanks! And Lydia Sanders, you are describing the difference between a linguist (one who observes and studies language changes), and a grammarian (one who decides what is correct and yells at everyone when they don’t do it). I do have my inner grammarian, but she’s pretty neurotic and unhappy that people can’t use apostrophes correctly, so I try hard to embrace my inner linguist instead! P.S. I especially like looking at it in this way if it means we can all stop using “whom” in formal writing. What a silly word! Let’s let it go the way of “thou” and “whence.” 🙂 Heresy, right? Thanks for this post, Brian. I always say that the object of good grammar is not just to adhere to a set of rules, but to enable your reader to clearly understand what you mean. Your two bowling sentences are perfect examples of when to use I or me to clarify your meaning. You have such a clear and easy way of explaining things. Thanks again!